MANILA, Philippines - State weather bureau PAGASA on Sunday evening, December 7, 2014 as of 11pm update has raised storm warning signal in Metro Manila as effects of Typhoon Ruby (Hagupit) will be felt starting tomorrow, December 8 (Monday) and will peak at around 8 – 10 pm. 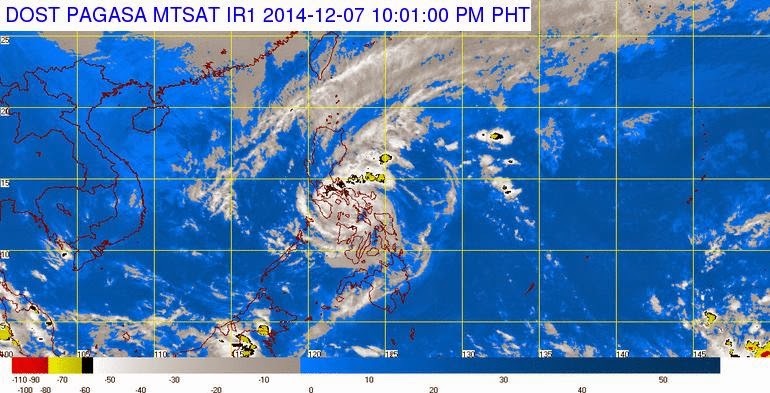 PAGASA said that Typhoon Ruby has maintained its strength and is now traversing the Sibuyan Sea. The expected third landfall is in Northern Mindoro between 6 – 8 pm tomorrow and it will be associated with strong winds, storm surge and moderate to heavy rainfall. The estimated rainfall amount is from 5 – 15 mm per hour (moderate – heavy) within the 450 km diameter of the typhoon. 'Ruby' and the Northeast Monsoon will cause rough to very rough sea conditions over the seaboards of Luzon and Visayas and over the northern seaboard of Mindanao. Fisherfolks and those using small sea craft are advised not to venture out over the said seaboards. The expected to exit PAR of Typhoon Ruby is on Thursday morning. 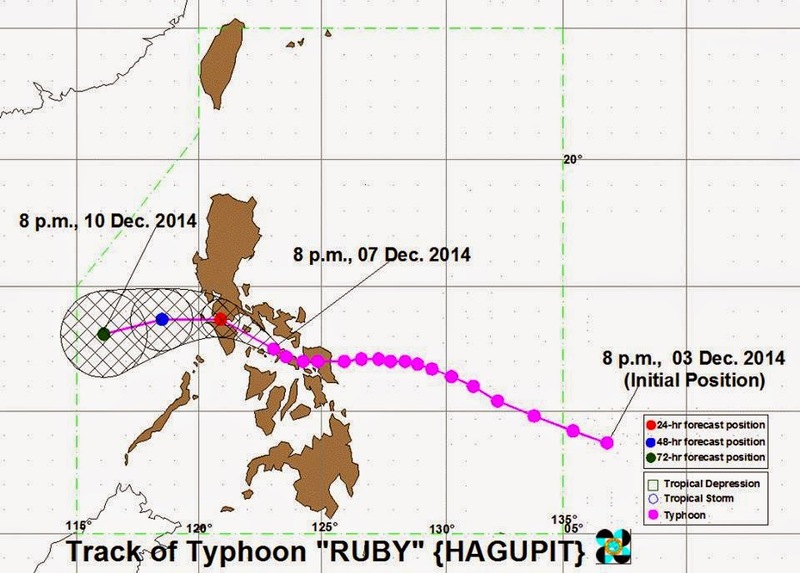 At 10:00 PM today, the eye of Typhoon “RUBY” was located based on all available data at 70 km Northwest of Masbate City (12.6°N, 123.0°E). It has maximum sustained winds of 140 kph near the center and gustiness of up to 170 kph. It is forecast to move West Northwest at 10 kph. 24 hour (tomorrow evening): 45 km Northwest of Calapan City, Oriental Mindoro. 48 hour (Tuesday evening): 290 km West of Calapan City, Oriental Mindoro. 72 hour (Wednesday evening): 550 km West of Calapan City, Oriental Mindoro. LUZON: Masbate, Ticao Island, Burias Island, Marinduque, Romblon, Oriental Mindoro, Occidental Mindoro, Batangas, Laguna, Cavite, Southern Quezon and Lubang Island. These areas will have stormy weather. Residents in low-lying and mountainous areas are alerted against flashfloods and landslides. Likewise, those living along the coast are warned on the occurrence of big waves associated with Storm Surge which may reach up to 3 meters. VISAYAS: Semirara Island, Biliran, Aklan, Capiz and Bantayan Island. These areas will have stormy weather. Residents in low-lying and mountainous areas are alerted against possible flashfloods and landslides. Likewise, those living along the coast are warned on the occurrence of big waves associated with Storm Surge which may reach up to 2 meters. LUZON: Polillo Island, Zambales, Nueva Ecija, Tarlac, Pampanga, Catanduanes, and Northern Palawan including Cuyo. These areas will have occasional rains with occasional gusty winds. PAGASA said that Public Storm Warning Signal elsewhere has been lifted.